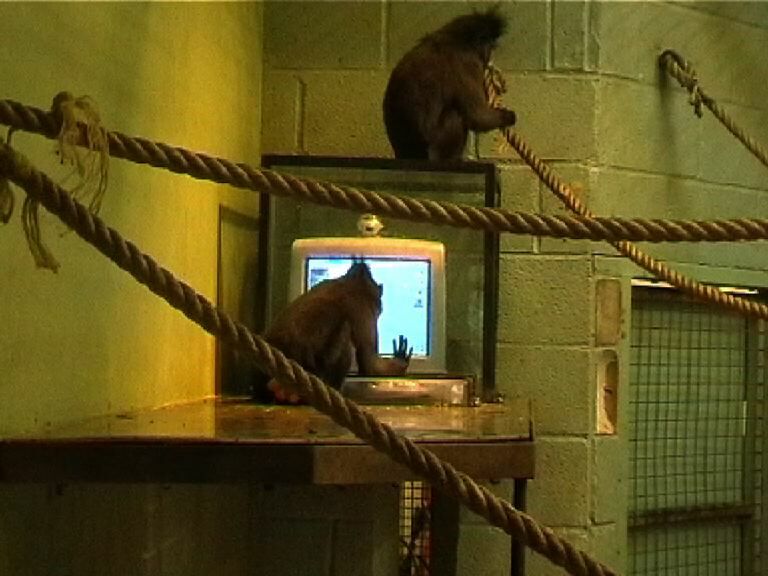 In 2003, a team of researchers left a computer keyboard in the enclosure of six monkeys and recorded their interactions with the unfamiliar machine. The remainder of the five pages produced were largely filled with the letter S.
Run by researchers from the University of Plymouth, the experiment was developed in response to the well-known infinite monkey theorem–the idea that an infinite number of monkeys, typing on typewriters for an infinite amount of time, will eventually produce the complete works of Shakespeare. In any case, what the researchers found was a significant problem with the idea of monkeys typing–monkeys will not sit down and continuously press keys at random. The initial interaction occurred when the lead male, with a stone in his hand, began to bash the keyboard. Following their aggressive leader, the other monkeys proceeded to defecate and urinate on the machine. Clearly, we would not expect these six monkeys to ever produce much of value, let alone a Shakespearean composition. What could we expect if we had infinite monkeys? Surely, using our judgment and sense, we could say that there is virtually no chance, regardless of how many monkeys or how much time we have, that they would ever produce all the works of Shakespeare. Yet, mathematically, given the nature of infinity–a scale far beyond our comprehension–the infinite monkey theorem suggests that some infinite monkeys on infinite typewriters with infinite time will, almost surely, produce these works. It’s simply a matter of having many, many attempts (in this case, an infinite number). You could see it as a much more extreme version of the lottery. Even though the odds of winning the jackpot of a 6/49 lottery with a single ticket are around one in 14 million, someone will almost surely win each time, simply because there are so many players and even more attempts. Million to one odds happen eight times a day in New York. In the case of infinite monkeys, the odds of typing out all of Shakespeare’s works may be extremely minuscule, especially if they tend to hit the keyboard with a stone rather than their fingers. But as long as the chance of hitting any key is not absolutely zero, the monkeys with an infinite amount of time will eventually produce enough attempts to achieve success. Does that mean our sensible judgment is wrong? Would we be incorrect to conclude that there is no chance of monkeys ever producing anything by Shakespeare? After all, to give a sense of the near impossibility of the situation: even if every one of the 1080 particles in the known universe was somehow a monkey, and each one could type at an unfathomable speed of, say, 100 000 keys per second, there is still virtually no chance that they would replicate even a short book within the life of the universe. Is our intuition correct–that there is no chance, regardless of the amount of monkeys or time? Or should we accept the mathematical argument, that success is almost guaranteed with infinite monkeys? This odd conflict about odds reveals two sides to the interpretation of probability. Neither is incorrect, depending on our viewpoint. If we accept the mathematical view, we are subscribing to a frequentist interpretation of probability, currently the dominant view. Under this interpretation, the probability of an event is simply the frequency of its occurrence in a large number of trials. On the other hand, if we believe in our sense and judgment, we are taking a subjective interpretation of probability; we are using our own beliefs and knowledge about the process in order to judge the likelihood of success. This is the way we most often assess situations and make decisions–using our existing knowledge, we come up with a subjective estimate of our odds of success or failure. A gambler may continue to play, believing that his odds of winning are higher than the mathematics of his game would suggest. In fact, the very idea of luck implies a subjective bias in our assessment of chance. If you don’t believe in luck, even a decision such as choosing between two jobs relies on our subjective estimate of our chance of success in each. These views–the frequentist and subjectivist–are not the only interpretations of probability. Prior to the nineteenth century, the classical definition of probability was the dominant viewpoint. It was an early attempt to quantify probability by mathematicians such as Pierre-Simon Laplace and Jacob Bernoulli. The theory arose from games of chance, typically involving coins or dice, and was correspondingly simple. In order to determine a probability under the classical interpretation, you would count the total number of possible outcomes and the total number of favorable outcomes, and find their ratio. An easy example: When attempting to roll a 3 on a six-sided die, there is one favourable outcome (rolling a 3) out of six possible outcomes, giving a probability of 1/6. The problem, however, is that this approach assumes an equal probability for every outcome. While fine for situations such as rolling a single die, where every side can be said to have an equal chance of landing up, this assumption falls flat when dealing with more complex situations, such as having an infinite number of outcomes. Even for a game as simple as flipping a coin until it lands on heads, this problem of infinite outcomes arises. It is not possible to count all the possible outcomes; it could happen (although it is unlikely) that no head appears even after hundreds or thousands of tosses. In such a case, we could not use the classical definition to determine the probability of success. However, this does not necessarily imply that the definition is wrong–its uses may limited, but it does have uses. The frequentist, subjectivist, and classical views are but three of many interpretations of probability, each taking a different stance on the nature of uncertainty. With each interpretation, we gain insight into quantifying this uncertainty–so that we may, in some way, be more certain of our uncertainty. Cox, Geoff, ed. Notes Towards the Complete Works of Shakespeare. Kahve-Society, 2002. DeGroot, Morris H., and Mark J. Schervish. Probability and Statistics. 2002. Addison-Wesley, New York, n.d.
“No Words to Describe Monkeys’ Play.” BBC, May 9, 2003, sec. Devon. http://news.bbc.co.uk/2/hi/3013959.stm.